Free download Fresh View latest version. 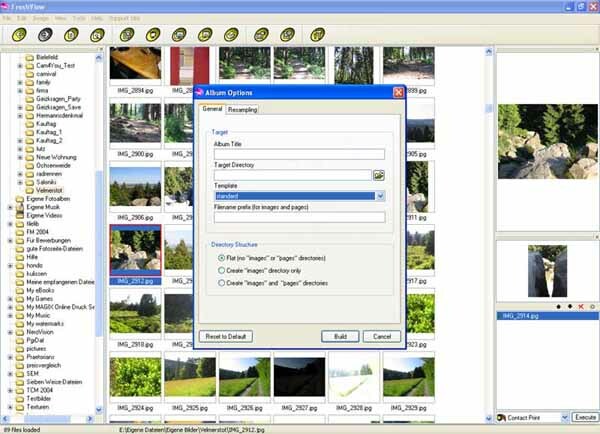 It is not only image viewer software but you can use it to watch videos and for audio clips. You can watch videos, listen audios and to see images in an organized way. It also provides all kind of information about videos and images etc. It offers thumbnail view. One of its best features is its HTML option. You can create an HTML album and HTML page as well. But the one thing disappoints that it has only one layout available. It is best for its simple usage. Fresh View supports more than 80 different file formats and Company is adding more and more formats to Fresh Viewer day by day. It offers different functionality like, copy an image to clip board, print an image and offers viewing pictures as slide show. User can create their new file frames. It does not have batch-renaming option. The one who has heavy photo albums, video and audio files and faces problems to handle with all these files quickly, would love Fresh Viewer software. Having these all functionality it is 100% free of cost which is its best thing.